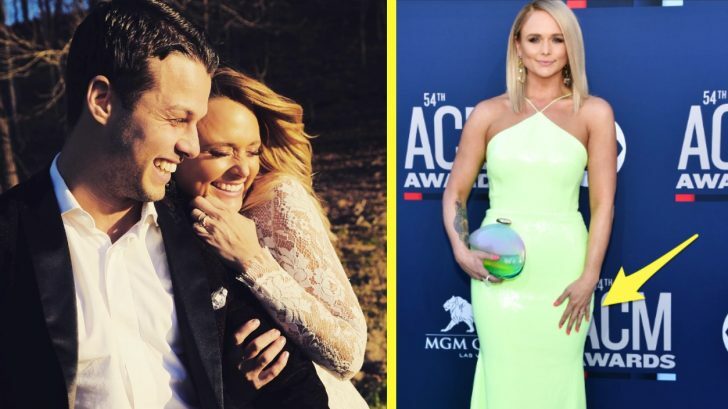 Hitting the red carpet in an unmistakable neon-green dress with her new husband of four months, this country music star gave the world a very close-up look at the massive engagement ring she’s been rockin’ for months now. Miranda Lambert, who was previously married to country singer Blake Shelton, shocked the world in February 2018 when she revealed that she had secretly gotten married just a few weeks before – to a man nobody even knew she was dating. Taking him to the ACM Awards was their first-ever public appearance and she showed him off fabulously during their strut toward MGM’s Grand Garden Arena in Las Vegas. The 54th Annual ACM Awards had Lambert set up for several performances that evening and also had nominated her for two separate categories – one of which she’d been the reigning winner for over half a decade. After several months of keeping a super-low profile, both she and husband Brendan McLoughlin stepped out in style donning a classic tuxedo and neon-green sequin gown that were sure to catch a few gazes! Beyond the bright attire, Lambert also took the opportunity to flash the massive rock McLoughlin had given her when they got engaged – and it is gorgeous! Surrounded by a halo of diamonds in a rounded diamond shape, this stunning ring looks to be either rose gold or gold and boast a weighty rock in the center that draws one’s eye in nearly immediately. A lot of folks thought Miranda was one lucky gal when she showed off her good-lookin’ police officer hubby, but surely they’re convinced now that they’ve seen what kind of ring he picks out!